Less than a day has passed since the Israeli navy attacked an international Gaza Freedom Movement “Freedom Flotilla,” intent on breaking Israel’s blockade of the Gaza Strip, in international waters. The explosion of media coverage surrounding this makes it likely the highest-profile act of (supposedly) nonviolent resistance to occur in years. But the dust has yet to settle. The boats and the activists who were aboard them are still under Israeli control, and so also, therefore, is the story of what really happened. As information comes in, here are some questions to keep in mind for thinking about this horrific event through the lens of nonviolence. Were the activists really acting nonviolently? There has been considerable controversy thus far about who provoked whom to the violence that finally ended in deaths aboard the flotilla ships. 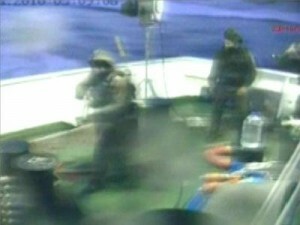 It appears as if some people aboard took matters into their own hands and attacked the Israeli soldiers. But many of those leading the mission were seasoned activists committed to and trained in nonviolence. Their primary cargo was humanitarian aid, and their purpose was to make a political point, not engage Israeli forces in combat. If fighting broke out when armed Israeli forces arrived that is to be regretted, but that should not be mistaken for the Gaza Freedom Movement’s intentions. How are the mission’s success and failure being measured? Some are going to look at this and say, “See, they tried a nonviolent approach, and it ended in violence. Therefore, the mission failed, and nonviolence doesn’t work.” It would be particularly troubling for those Palestinian activists who are thinking about trading violent for nonviolent methods to come to this conclusion. But nonviolent resistance always involves self-sacrifice on the part of those who struggle for justice. Though the tragedy in the loss of life is not to be downplayed, the flotilla has already proven successful in significant ways; people around the world, including influential leaders, have responded by condemning the Gaza blockade, and millions more have learned about the international movement to transform the conflict in the region. Was the flotilla a mission of aid or activism? Reports often describe the flotilla’s purpose as humanitarian aid. In turn, Israel offered to deliver the supplies to Gaza itself, precluding the need for the flotilla to finish its delivery. It is true that the ships carried humanitarian supplies. But the mission also had an explicitly political purpose, to resist what the activists understand as the injustice of the Gaza blockade. Whose suffering is the media considering grievable? We already know that the Western media is more likely to concern itself with the deaths of Westerners than that of others. This is a tendency that we need to counteract. We should strive to treat all victims as if they are one of us and worthy of our deepest concern. We should also be attentive of the tendency to portray criticism of Palestinians and their advocates as plausible, and criticism of Israel as simply anti-Semitic. What laws were violated, and why? Laws were violated on both sides. Israel attacked a ship in international waters, in violation of international law. And the flotilla intended to break the limits imposed by Israel’s blockade. On the one hand, not all laws are equal; the blockade itself has been called illegal by a United Nations report last year. On the other, not all violations are equal; Israel violated international law out of convenience, with little or no expectation of consequences (since it hasn’t suffered them for past incidents), while the activists on the flotilla intended to flaunt the blockade as an act of conscience, exposing themselves to the consequences. Who are the activists representing? There is already a tendency in the reportage to point out the support of violent actors, like Gaza’s Hamas regime, for the flotilla. Some will contend that the activists are therefore supporters of what has been labeled “terrorism.” Attempts are also being made to link the activists to extremists in Turkey, which the Turkish government reportedly has investigated and strenuously denies. Whatever the case may be, it’s important that we not let the activists’ actions be falsely conflated with those of others. Making such conflations are very much in the interests of those who would want to justify Israel’s disproportionate violence; nonviolent resistance is often more threatening to the powerful than violent resistance because it so visibly undermines their claim to moral superiority. How is the official story being manipulated? By conducting its own investigation before allowing any foreign journalists or authorities to participate, Israel is being careful to ensure that its version of events is the only version. The Israeli government has already been hurriedly trying to explain its own violence with allegations that the activists were armed and intent on delivering materials meant to be weaponized. If Israel were to plant weapons on the scene after the fact to distort the investigation, it would only be following the US’s example in Iraq. Since this incident took place in international waters, involving people from around the world, a truly international investigation should take place immediately. For now, first of all, we can at least mourn the deaths of those killed on the ships, alongside those whose lives have been destroyed or ruined in the wider conflict, both Palestinian and Israeli. The refusal to tolerate and glorify violence, whether conducted by the powers that be or the disempowered, is the first step toward bringing about nonviolent change. Non-violence is clearly the most effective method for winning justice for the Palestinians, but it takes discipline and leadership to overcome years of deeply entrenched anger and misguided celebration of violence. Gandhi never succeeded in convincing most Indians to practice satyagraha, and there were many instances of violent acts that undermined his non-violent campaigns. David, I would suggest as an addition that justice for Palestinians would also be justice for Israelis. I am not confusing the group of people has the greater exercise of power, and which suffers more. We meet as individual human beings, which might be given priority in that instance, over any segmentation into group memberships. Of course, most of us, myself especially are sociologically blind and ignorant for the most part. For example, in my part of the world, when the injustices to the Aboriginal and Maori people are acknowledged and understood that affirms the values of the now culturally dominant people. I suggest the writer read UNSC Resolution 1860, which is the law governing the situation. Indeed, the flotilla was trying to enforce that law, as 1860 deems the blockade illegal and immoral. I suggest that karlof1 actually read UNSC 1860. It is only your OPINION that the blockade is illegal and immoral. It says NOTHING of what you claim. Israel limits the areas of entry into Gaza because Hamas has a tendency to smuggle in weapons and a nasty habit of lobbing rockets and mortars at Israeli civilians. Neither side paid any attention to the UN anyway, but that’s just further evidence of the UN’s worthlessness. 3. The Security Council welcomes the initiatives aimed at creating and opening humanitarian corridors and other mechanisms for the sustained delivery of humanitarian aid. The Israelis were directing the aid to proper overland routes. The Egyptians also made an offer to deliver the aid. The organizers declined. IMO this is where the FGM went from nonviolence to violence challenging a sovereign nation’s security. The activists actions led to the confrontation where some of them took up arms against the commandos. After that, the soldiers reacted in self defense. Watch the videos of the action. The S13 commandos were attacked as soon as they came off the fast ropes. Some of the “activists” obviously planned to violently resist and reaped their just rewards for stupidity. Adam Shapiro, one the incompetent leaders of the “Free Gaza Movement” claimed that the soldiers were firing as they were coming down the ropes. As someone has has fast roped before, that is virtually impossible…unless you enjoy falling. The blood is on the hands of the FGM leadership and those that violently challenged the IDF. Deliver your aid, yell really loud, hold up signs, GOOD. Trying to run blockades, throwing an Israeli commando off the ship, taking Israeli commando’s weapon and using it, beating Israeli commando with clubs, stabbing Israeli commandos with knives, very VERY BAD. If the Palestinian leadership REALLY renounced violence, they’d have their own country years ago, but alas the folks at Hamas and Hezbollah aren’t about to let that happen. 5. Intimidate or bribe people involved. The broad pro-Palestinian / peace / solidarity movements are doing this extraordinarily well at present (most activists have an innate sense of this anyway.) The model has more detail and well worth applying some of its lessons here – particularly about wariness over ‘official channel’ of redress.